You might remember Mitsu sensei from this lesson. We love his adorable face! OK, ミツ先生( = Mitsu Sensei) 今日のレッスンよろしく！( = Kyou no ressun yoroshiku!) Thank you for today’s lesson in advance! = Mitsu desu. Boku no koto oboeteru? = I’m Mitsu. Do you remember me? = Boku mo Team Maggie ni haitte imasuyo. = I am also a member of Team Maggie. Today I will teach you the casual suffix, かな ( = kana). 1) When you uncertain / wonder about something. Note: We sometimes stretch the sound かな ( = kana) in conversation. We also write かな〜 (=kanaa) in casual written style. = Watashi, sona koto itta kana? = Did I say such a thing? = I wonder where Maggie has gone. = I wonder if it’s delicious. = I wonder if Maggie is doing well. = Maggie Sensei no saito wa mou nakunaru no kana to shinpai shiteimashita. = I was afraid Maggie Sensei’s site would be gone. = Ima Maggie wa genki nanokanatte kangaete itano. = I was just wondering how Maggie is doing. = Kore oishiku nai no kana..
= Kare watashi no koto sukijanai no kana..
= I wonder if he doesn’t like me. = Maggie sensei wa kekkon shite inakatta no kana. (It shows your desire.) I hope it is going to be a nice weather tomorrow. But sometimes it also shows your fear or anxiety. = I wonder if it is going to rain tomorrow. = I am afraid it is going to rain tomorrow. It expresses your anxiety more. = I am afraid if we will have an earthquake.. So you have to know the context well. 2) When you are uncertain about something and asking someone’s opinion in a subtle way. = Kono sukaato mijikai kana? = Do you think this skirt is too short? = Nee watashi demo tsuyaku ni nareru kana? = Do you think even I can be an interpreter? = Nihon ni iku noni sendoru jaa tarinai kana? = Do you think $1,000 is not enough to go to Japan? 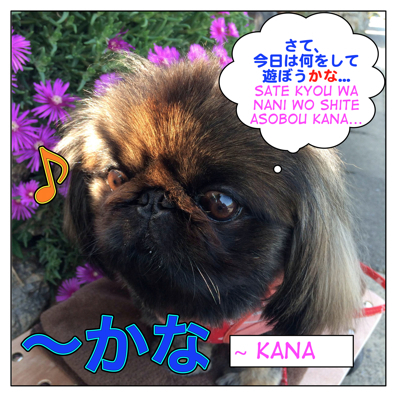 かな ( = kana) suffix adds some nuance of uncertainty, “I could be wrong but…” so we sometimes add it on purpose to avoid sounding too straight forward in colloquial conversation. = Sore Amazon de katta no? = Did you buy that on Amazon? = Sore Amazon de katta no kana? = Did you buy that on Amazon by any chance? = How much did it cost? = Sore ikuragurai shita no kana? = I wonder how much you paid for that. 4) When you express disagreement. = Maggie Sensei tte kawaii yone. = Maggie Sensei is cute, isn’t she? 5) When you ask someone for a favor casually. = Yokattara tetsudatte kureru kana? = I wonder if you can help me…/ Can you help me if you can? = Waruikedo, ashita made ni kore yareru kana? = I feel bad but do you think you can do this by tomorrow? = Koko ni suwatte mo iikana? = Do you mind if I sit here? When you use it with a verb in a negative form. = Can we get together tomorrow? = Kono hon, kashite kurenai kana? = I wonder if you can lend me this book?/ Can you lend me this book? = I wonder if it’s delicious? = Yokattara tetsudatte kureru kashira? = Do you think you can help me? Note: かしら kashira sounds VERY feminine. Even a fine lady like Maggie Sensei has never used it, but I bet you will hear/see it somewhere. Do you think you can do ~ ? = Kore Micchan ni dekiru kana? = Hitori de kutsu ga hakeru kana? Note: You can also replace かな ( = kana) with かしら ( = kashira) for female speech. But remember: it sounds very feminine. 7) When you give someone a piece of advice or when you suggest doing something in a subtle way. = Minna de Kyouto ni ittara dou kana? = How about going to Kyoto together? = Kanji wo mainichi hyakuji zutsu oboetara doukanaa. = How about memorizing 100 kanji every day? = Kono natsu, dokoni ikou kana. Itaria ni ikou kana. = Where should I go this summer. Maybe I should go to Italy. = Kyou wa ichinichi ie ni iyou kana. = I guess I will stay home all day today. / Should I stay home all day today? = Dono DVD wo saisho ni miyou kana. = Kyou wa nanimo tabenai de okou kana. = I guess I won’t eat anything today./ Maybe I shouldn’t eat anything today. = Kanojo ni puropuzu shiyou kanaa. = Should I propose to her? / Maybe I will propose to her. = I guess I will go to bed now. = Sorosoro benkyou shiyou kana. = I guess it is time to study now. = Kono ressun nagaku narisugita kana? Saigo made yonde kurete arigatou! Mata koko ni oshieni kurune. = Do you think this lesson ended up being too long? Thank you for reading all the way to the end. I will come back and teach you again. = Thank you, Mitsu Sensei! = Kyou wa, nekochan to onigokko wo shitara doukanaa. = How about playing tag with a kitty today? だろうか is more literal and かな is much more conversational. I wonder if he would do such a thing. I wonder if it is going to be a nice weather tomorrow. 明日は晴れるかな？ You can use both to ask yourself (talking to yourself) or ask someone else. 明日は晴れるだろうか。 You say that only when you talk to yourself, expressing your doubt. Arigatou Sensei! you are the best! If my memory didn’t deceive me, I saw a man use 何かしら before. Is this an exception? I found it. It is from a manga. A conversation between two young men. 何かあるだろ→なんかしらあんだろ = You must have something. You add かしら with なに、だれ、どこ and add the nuance of assumption. Thank you for this site btw. I recently got back into studying after losing motivation and almost stopping. This site has actually helped motivate me again. I’m glad to hear this site helped you motivate you again. You hear that in anime or TV drama but it may sound too feminine. So never ですかしら , but is there any rule for using かしら politely? I may be wrong but 美味しいかしら sounds informal? And thank you very much Maggie-sensei, I learn a lot! 先生、can we use かなwith ある? Here is my attempt to translate. Please let me know if I’m far off. I’m so happy that I feel that I’m going crazy. I wonder if my condition indicates that. But this doesn’t sound like natural English, so if I can rephrase it, I’d say “I’m so happy that I feel that my condition indicates that I’m going crazy.” This still sounds cumbersome, to be honest… Sigh. I wonder this is what it’s like to go crazy with happiness. Ahhh…. That’s so much better, Maggie Sensai! You’re the best!!! I’ve been reading your various posts, and they are real treasures to me!! Thanks a million! I am happy to hear you have been reading my lessons! Long time no see, Maggie ^ ^ (although I’m almost everyday here to check your comments and learn – thanks to that – something new). I’ve got an additional question regarding this post. Could you tell me, Maggie, how strong the meaning would change, if we use instead of ～のことをいうのだろうか just ～なのだろうか or ～のことだろうか. In other words, why was here used ～をいう? 1), 2) and 3) mean the same. Simply stating the fact. A is B. The meaning is the same as C) but it sounds more explanatory. I’m doing fine, thank you for asking. While I was preparing my breakfast I had an enlightenment regarding my yesterday’s question. I realized that this をいう has the meaning of “to be called”, therefore 幸せで気が狂いそうというのは、こういう状態のことをいうのだろうか = I’m wondering if this [referring to a certain state/condition] is what is called to feel like going crazy with happiness. I often hear Japanese adding “なになに~いいじゃないかなぁと思う” or “なになに~じゃないかなぁと思う” when they are interviewed on the Youtube?. 1. What is the meaning behind adding じゃないかなぁ to the ending part of the sentence? I am so sorry. I just read your question dated December 17th. I must have been gone for vacation then. ~じゃないかなあと思う = I wonder if it could be ~ You are not sure. It sounds more uncertain than じゃない. 2. ~（ん）じゃない？ is used when you express your opinion. Ex. 1) 彼は忙しいんじゃないかなあと思う。 I think he could be busy. (I am not sure) Expressing your assumption in a mild way. I have a lesson on じゃない？. Please go check it. → Click this link. What does it mean どうかなさいましたか,? = What is the matter with you? / Is everything all right? / Anything wrong? / What happened? Hello, Maggie-sensei! How are you doing? ^_^ It’s me again, Ritsuko! Hello Ritsuko! I’m good! Thank you for asking! ありがとうせんせい！That really helped me. But can you please answer question number 2? About this sentence “漢字を毎日１００字ずつ覚えたらどうかなあ？” what is “ずつ”? What’s its position in a sentence? 1. “今日は何も食べないでおこうかな。” what is “おこう”? 2. “今日は一日家にいようかな。” This “いよう” is “いる”? 3. “みんなに日本語を教えることができてうれしいです。” What is the function of “できて” here? 4. “夏休み、どこに行く？海外に行く？” Let’s suppose I want to go abroad. If I answer “海外がいい”, then is it ok? or we have to be more specific? “Thank you so much in advance.” By the way, how do you translate this sentence into Japanese? Ex. 漢字を毎日１００字ずつ覚える= to memorize/learn 100 kanji “per” day. ~ でおこう= try/will not to do something (intentionally)/~ないでおこう= try/will not to do something (intentionally). 2. 家にいる= to stay home (to be home )→いよう= will stay home. Thank you for your answer, but what’s exactly the position of ” ～としても”? After the verb? ”～にしても” is same? or a different grammar point? 1. What is the difference between “もし” and “もしも”? 2. 見てみなさい. What is this verb? I know it’s imperative but I’ve never seen this pattern before. 3. あがれるじょうたいじゃないの分かるでしょう？What is ”あがれる” and What is the meaning of “あがれるじょうたい”? 4. それに　私　この仕事　けっこう　好きかも。”かも”　is maybe here? or another meaning? 5. ”するの” what is this grammar point? Please give me examples. 1. もし”も” : “も” emphasizes more. 3. It depends on the previous sentence. If they are talking about going up somewhere, あがれる= to be able to go up somewhere. 4. It is very colloquial way to finish the sentence. We tend to avoid straight expressions in Japanese. So instead of saying 私はこの仕事がけっこう好きです, you add かも at the end and softens the sentence. Thank you very much for the lesson, Maggie Sensei! I didn’t realize 〜かな could be quite deep! The lesson makes so much sense, however, I just ran into this sentence which I don’t understand. What do you think this sentence may possibly mean? *Note：We often omit the particle (in this case を(=wo) in casual conversation. I want to ask about “かしら”。If it’s very feminine, then who can exactly use it? Usual people? Also, what is this grammar point ” ～としても”？ How to use it? Sorry but I can’t specify what kind of people use it. Since we hear this often in anime characters, they sounds a bit dramatic. Ex. そうかしら。= I wonder if it is true. Ex. 私にもできるかしら= I wonder if I can do it. Not just feminine but in my opinion, it gives an impression of being snob when it is used in polite form. Ex. やっていただけるかしら。= Could you do that for me? (1) when you are talking about hypothetical situation. = Even if we leave now, I don’t think we can make it anyway. = You can use this also as a spectacle case. 1. In this sentence “さて、今日は何をして遊ぼうかな…” Why did you add “して”? Is it wrong to just say “さて、今日は何を遊ぼうかな…”? 2. “もう食べていいかな…” Is it wrong to add “も” after “食べて”? I’m confused as this pattern is different..
3. “マギー先生のサイトはもうなくなるのかなと心配していました.” What is the function of “と” here? Glad to know you find some of my lessons help you a little. We use this pattern with 遊ぶ(=asobu)、過ごす(=sugosu), etc. = Shuumatsu wa nani wo shite sugoshimasu ka? = What are you going to be doing this weekend? 2. Yes. It is originally もう食べてもいいかな？ We omit て in conversation. 3. this と has a function of quoting. “マギー先生のサイトはもうなくなるのかな”＋と＋思う・言う・心配する etc. Also check the audio in Hiragana Chart lesson. Thank you very much for this interesting lesson! I thought I knew everything about かな（あ） but apparently I didn’t. っかな and ～ないかな (I hope~ ) was quite new for me. I’m very happy that your lessons are so complex. I’m glad to know there is still you can learn here. There are cases you can replace them and the translation could be the same but there is a subtle difference. while かな is used when you express your doubt or question, だろう is used when we guess/assume something. あの人は誰かな = I wonder who that person is. あの人は誰だろう= I wonder who that person could be. 彼、私のこと好きじゃないのかな I wonder if he doesn’t like me. 彼、私のこと好きじゃないの(or ん）だろうな…　I guess he doesn’t like me. *明日、晴れないかな = I hope it is going to be a nice weather tomorrow. *明日、晴れないだろうな… = I think (assume) it is not going to a nice weather tomorrow. かわいいかなあ = I wonder if S is cute. かわいいだろうな = I imagine S is cute. I guess they both suggest the idea of going to Kyoto so the translation is the same but while どうかな simply suggests going to Kyoto, どうだろう gives us impression that the speaker is imagining how it would be going to Kyoto together.